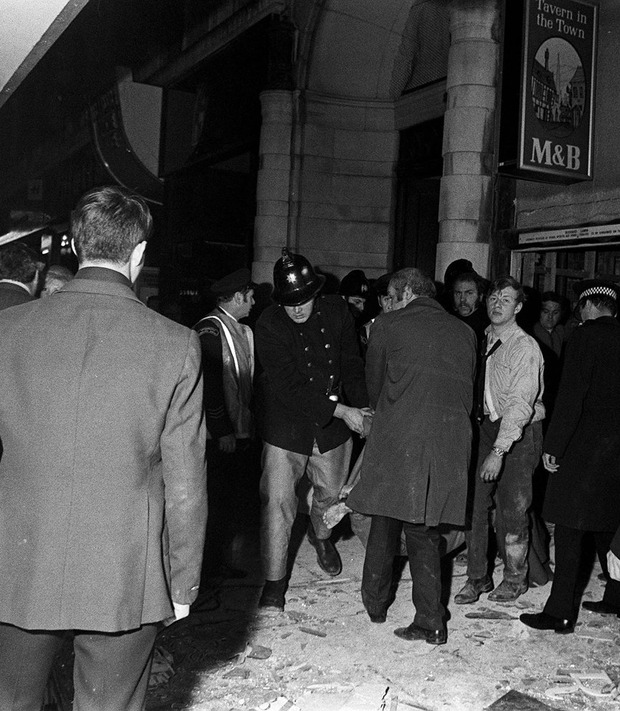 The blasts at the Mulberry Bush at the bottom of the city's landmark Rotunda, and the basement Tavern in the Town in nearby New Street, killed 21 people and injured 220 others. Yesterday, in a dramatic turn, an anonymous former IRA volunteer giving evidence at the inquests, said he had been told six months ago in Dublin by the current head of the IRA that he could name those he knew were involved. The man, identified only as Witness O - speaking over a secure video-link - named the officer commanding the Birmingham IRA at the time, Seamus McLoughlin, as the person responsible for selecting the targets. He added that Mick Murray was "one of the bombers", and claimed he recalled Mr Murray telling him there would be "no harm" if similar attacks had been repeated, because of the "chaos" caused. Pressed by Leslie Thomas QC, the barrister representing nine of the bereaved families, that another member of the bombing team was Michael Hayes, he replied: "Hayes, Hayes - I'll give it [the name]to you now." But he added, in apparent reference to the Good Friday Agreement: "But he can't be arrested. Then asked about "James Gavin", he replied: "Well, he was [involved], I met him in Dublin and he said he was." Seamus McLoughlin died in 2014, Mick Murray in 1999 and James Francis Gavin in 2002. Earlier, the witness had said "I only know about five", claiming at least one of the men was still alive, before adding: "He's no harm to anybody now." The witness, who earlier told the jury he was a convicted IRA bomber who served a prison sentence in the 1970s, replied: "No, I don't remember him at all." Mr Reilly and Mr Hayes have always denied any involvement in the blasts, though Mr Hayes has said he took "collective responsibility" for all IRA attacks in England. As the names were given, many of the bereaved family members broke down. Outside court, Julie Hambleton, whose sister Maxine was killed in the Tavern in the Town, said: "Witness O has today named the bombers involved in the Birmingham pub bombings. "I have a letter from David Thompson, chief constable of West Midlands Police, that says this is an on-going live investigation [and] as such we expect action."